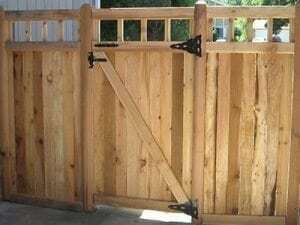 With the help of A Straight Up Fence Company in Denver, long-lasting cedar wood gates can be built to any size you want, from walk gates to double drive gates. Based on your specific needs, such as vehicle size and any equipment you might have, we will also customize your wood gates to operate as efficiently as possible by helping you choose the best opening style – swing, double swing, sliding or cantilever. You could go with a 5-foot privacy walk gate with a 1-foot, open fence top that lets you see out. A variety of door handles and deadbolt styles can also be added to meet your security needs. Keep out unwanted visitors with a double swing gate to finish off your perimeter fencing. One customer wanted secure but easy access, so we added a simple door handle and deadbolt. For a more streamlined look and added function, we can continue your full, 6-foot privacy fence with cedar wood gates for both walking into the yard and driving vehicles into the garage.